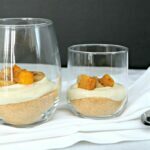 While there is no baking required, and cottage cheese is used rather than cream cheese, you won’t believe how much these dessert cups taste like authentic cheesecake. Roasting the banana and mango intensifies their flavour and the spices add to the tropical taste. Preheat oven to 425 °F (220 °C). Line a rimmed baking sheet with parchment paper. In a medium bowl, combine 1/2 tsp (2 mL) of the cinnamon, nutmeg and lemon juice. Add bananas and mango; stir gently to coat fruit with spices. Spread out on prepared baking sheet. Roast for 10 to 15 minutes or until fruit is browned and soft, but still holds its shape. Let cool until just warm. Set 8 of the best looking banana slices and 12 of the best looking mango pieces aside for garnish. In a food processor or in a large, tall cup using an immersion blender, combine the remaining roasted banana and mango, brown sugar, Cottage cheese and vanilla; purée until smooth. Add yogurt and pulse until blended. Taste and add more sugar, if necessary; pulse to combine. In a small bowl, combine graham crackers with remaining cinnamon; spoon into bottom of 4 wide-mouth small mason jars or clear dessert dishes, dividing equally. Spoon in Cottage cheese mixture, then top with reserved roasted fruit. Serve immediately, or cover and refrigerate for up to 1 day before serving. You want bananas and a mango that are ripe so they’re flavourful, but still firm, so they hold up to roasting. Buy a few bananas and a couple of mangos at different stages of ripeness a few days before you plan to make this recipe to make sure you can choose the best of the bunch. If your fruit is sweet enough you shouldn’t need to add more sugar. Taste the puréed cottage cheese filling and decide if it needs a touch of sweetness to bring out the flavour; stir in 1 tsp (5 mL) sugar at a time, to taste, up to an additional 3 tsp (15 mL).